Slacking off of the prevailing winds are allowing a pool of warm water to slosh across the Pacific Ocean basin, marking this as a potential El Niño year. The newly-released water-temperature data from NOAA reveal a Kelvin wave of warm water arriving on the west coast of the Americas. Deep pool of warm water sloshes towards the west coast from February to April 2014. Normally, winds push sun-warmed water from east to west, so the western Pacific is literally both warmer and higher sea level than the east. Periodically, those winds die down or even reverse direction, and the pool of warm water is released. It sloshes back across the ocean basin in a Kelvin wave, potentially triggering a cascade of climatic events. When the average monthly temperature in the eastern Pacific hits at least 0.5° Celsius above average and stays, it's an El Niño. The National Oceanic and Atmospheric Administration (NOAA) declared an El Niño watch in March, eyeballing the warm swash of water suspiciously. 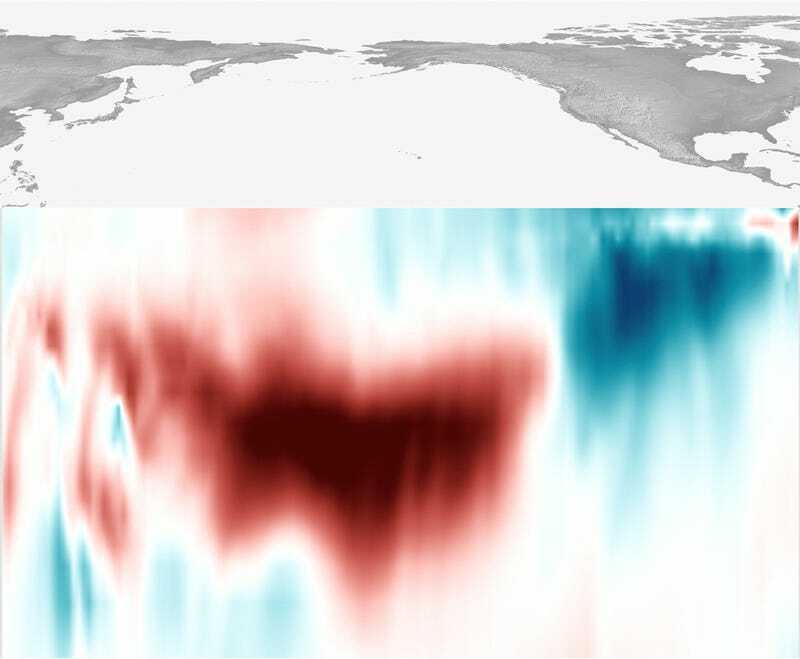 The images are five-day average ocean temperature in mid-February, mid-March, and mid-April compared to average temperature from the same times in 1981-2010 reveal a distinct warm pool. That pool is sloshing east each month, creeping closer to the critical 0.5° Celsius above-average temperature. Technically, it's only an El Niño year when the surface temperatures reach at least 0.5° Celsius above-average over a three-month period, and then stay at least that warm for five consecutive three-month periods. You can expect a lot of, "It's shaping up to be an El Niño year!" news coverage as we wait out the arbitrary time line until it's officially an El Niño. El Niños, the warm phase of the Southern Oscillation, set off an entire range of climate conditions. The west coast of North America gets warm, wet weather triggering everything from landslides to potholes. South America takes that theme and bumps it up a notch of intensity for deluges of rain. The warm surface water reduces upwellings of cold, nutrient-rich water, negatively impacting fish populations. The east coast gets a bit of a break — El Niños are linked with suppressing hurricane season. Australia and southeast Asia have their rain stolen, resulting in a dryer season with greater chance of raging bush fires. Slate has a detailed run-down on what to expect in cities around the world if this is an El Niño. The distance scale on the images is not consistent — the Pacific Ocean is less than 11 kilometers deep at its deepest, yet stretches 19,800 kilometres across the equator. Keeping them at the same scale would mean that 300 meters of depth would be less than a pixel on the image, rendering the visualization useless. Image credits: NOAA/Dan Pisut/CPC. Read more here. No, regular climate cycle events like El Niño and La Niña does not disprove climate change.